M.2 NGFF to 2.5in SATA adapter card. Do Support 22*42mm SSD. Easy to use. Do not need driver. 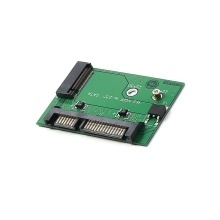 This adapter card can convert M.2 NGFF SSD into a SATA interface and then connect to the host computer to do data transfer. M.2 NGFF SSD to half size 2.5inch SATA adapter. ONLY support 2242 SSD. Do not support M.2 PCI-E SSD.